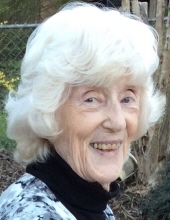 Big Brothers Big Sisters of East Tennessee remembers Edna Mae Geary Eickman, who passed away on March 19, 2018. Prior to BBBS-ETN, Edna served as a counselor in the Child Welfare Division of Contra Costa County Social Services, was a member of the National Probation and Parole Association, and the first female to visit San Quentin Penitentiary as the liaison for children in placement, incarcerated parents, and family rehabilitation. In 1965 and 1967 she and her husband decided to adopt two children, and at that point, she became a stay-at-home mom. During that time, she was very active in the PTA and served as Volunteer Coordinator for the Lafayette School District in Lafayette, CA. After her husband James accepted a position with Knoxville TVA in 1980, the family moved to Knoxville, where she continued on to become the PTA president of Farragut High School. After putting her life on hold to take care of their children, Edna returned to the workforce as Program Director for Big Brothers Big Sisters of East Tennessee. Edna enjoyed traveling, spending time with her family, and most importantly assisting children and families in any way she could. She retired at the age of 85 and passed at the age of 88. Her life and works will always be remembered and honored at BBBS-ETN and beyond. Each and every dollar you raise for Bowl for Kids’ Sake makes a difference in the life of a child. Got your eye on a prize but need help getting there? Let us help. By utilizing shared BFKS resources, personalizing your personal fundraising page, learning how to recruit teammates and how to ask for money, and creatively fundraising, you can hit your goal in no time! And, remember—our team is always available to provide resources and answer any questions you might have—just call us at 865.523.9455 or email development@tennesseebig.org . P.S.- After your fundraising page is set up, be sure to check in with your team captain to ensure your team has its lane reserved! If you are a team captain and your lane is not reserved, click here! 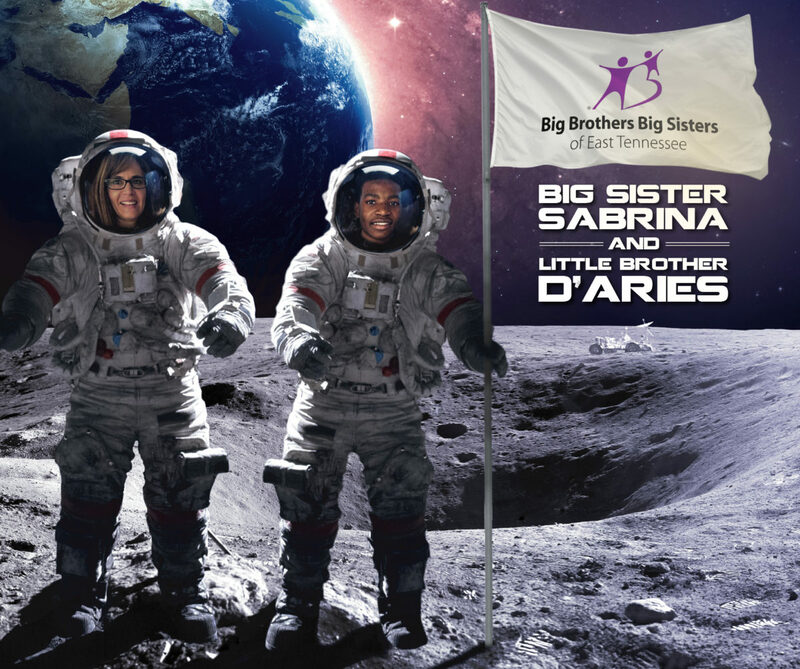 Big Sister Sabrina and Little Brother De’Aries have been matched in BBBS-ETN’s community-based program for 6.5 years (since December 2011). They enjoy going to sporting events and wood working. The duo likes to volunteer with foster animals and if they had a chance to go to outer space, they would name their rocket the “Vols Rocketship”. When they aren’t laughing at each other during blindfolded food-guessing contests, they are probably at the football field. “Watching him score his first touchdown was amazing”, said Sabrina, “it was one of the most proud moments for me as a mentor because he had worked so hard”. Do you two have nicknames for each other? Sabrina: “De’Aries’ nickname is “D” and mine is “Beana”. When you Bowl For Kids’ Sake, you help BBBS-ETN make more life-changing matches like Sabrina and De’Aries. This year, BBBS-ETN hopes to match 125 children with a mentor through the funds raised at Bowl For Kids’ Sake. In this week’s update, the team at Big Brothers Big Sisters of East Tennessee provides you some creative ideas for fundraising with your team — especially for those of you who have already shared your Bowl for Kids’ Sake page via social media and email. 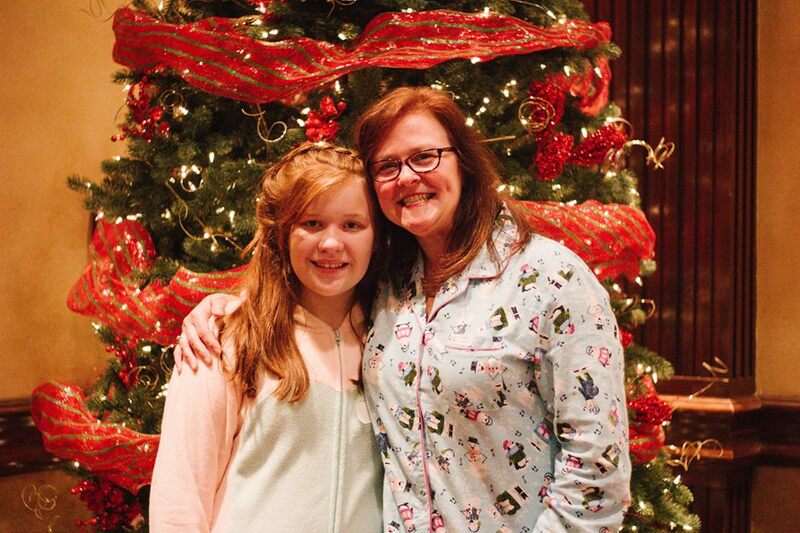 Big Sister Stephanie Smith (pictured above) recently celebrated her birthday in a BIG WAY. She gathered with friends and family at the YMCA, dressed in neon and side-ponytails, to dance the night away and raise funds for our agency. 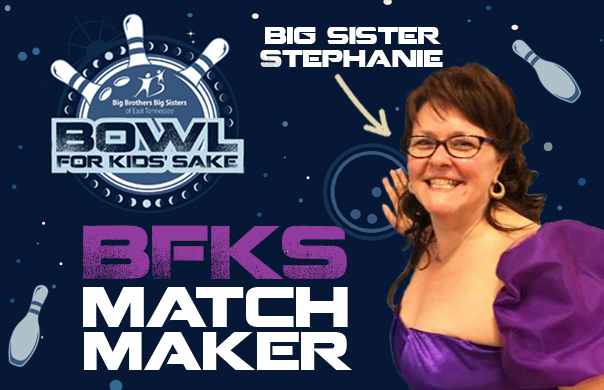 By asking her guests to donate to BBBS-ETN in lieu of gifts, Stephanie has raised more than $3,500 for Bowl For Kids’ Sake 2018! 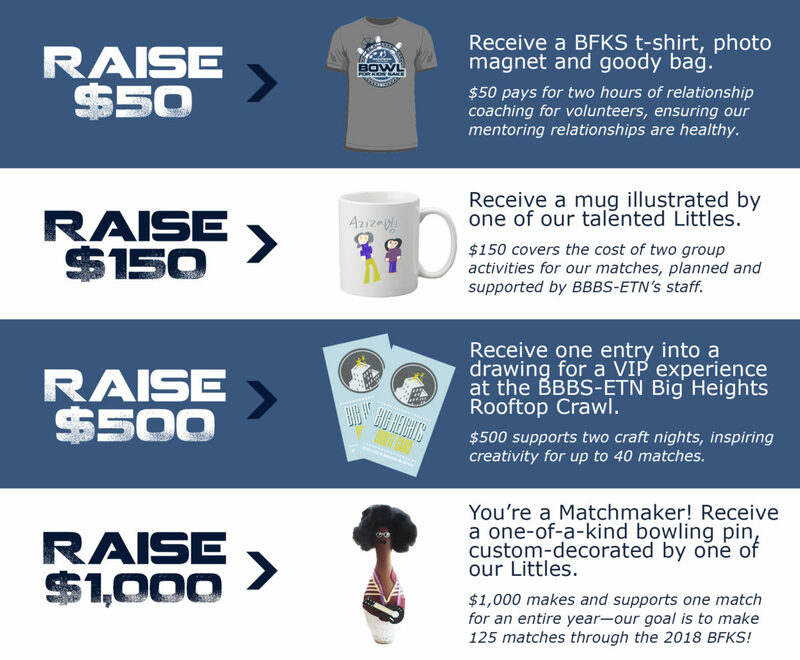 Below, we list a few creative ways to raise money to support matches of Bigs and Littles, while having a little fun along the way. Asking for donations isn’t always easy, but fundraising for Bowl For Kids’ Sake doesn’t have to be intimidating. Check out these creative ideas for your team fundraising, and remember that we’re about a month away from Bowl for Kids’ Sake 2018! Hold a drawing at work. Ask your employer if you can sell tickets to give your co-workers a chance to win a two-hour lunch, a half or whole day off, or a prime parking spot. Schedule a game night. Host a Monopoly, poker, bingo, or other game night and charge “admission” to benefit BBBS-ETN. Go green for Spring. Try selling fresh cut flowers or bouquets from your garden. Bake sale. Hold a bake sale at church, work, or school. Consider selling doughnuts, pastries, and coffee in the morning. Set a personal challenge. Grow a beard, take the stage at karaoke night, or paint yourself purple. It doesn’t matter what you do as long as your friends would pay good money to see it happen. Make sure you post your progress on social media! Good jeans. Ask your company and/or other companies in your building to sell tickets to a jean day for employees. Schedule a share-the-profit event. If you have a family member or friend that owns or manages a local business, ask them if they would like to donate a portion of a day’s profit to BBBS-ETN! Set up a snack bar. Create a cart where employees can purchase snacks like sandwiches, chips, cookies, juices and soft drinks. Open your snack bar for a week and have all the proceeds go toward your fundraising goal. Matching gifts. Many companies may give a flat donation toward your fundraising goal, while others may have gift matching programs. Check with your HR representative to see if your company offers this program. Nearly new sale. Collect your team’s gently used clothing or household items and host a weekend sale. Take photos of your items beforehand and post in Facebook groups or on Instagram stories to generate a buzz. Create a recipe book. Gather recipes from team and family members and compile the most delicious ones to create a recipe book to sell to friends and co-workers. You might even theme your recipe books to feature desserts or healthy meal options. Or, throw a party with a purpose like Stephanie did! By the way, if you missed our tips on how to recruit team members and how to ask for donations, click here to learn more. Need help setting up your personal site? We’ve got you covered. And, remember—our team is always available to provide resources and answer any questions you might have—just call us at 865.523.9455 or email development@tennesseebig.org . Thank you for registering for Bowl for Kids’ Sake 2018! In this week’s bowler update, we’ll provide a few details on how to recruit teammates and how to fundraise. Our team is always available to provide resources and answer any questions you might have—just call us at 865.523.9455 or email development@tennesseebig.org . If you’re a team captain, set a goal to recruit 3-5 participants. Where can you find these teammates? Ask your co-workers and plan to bowl during lunch or after work hours; reach out to members of community organizations; or recruit your friends and family members! Remind your teammates that it’s easy to raise the $50 minimum—plus, with so many dates to choose from, finding a location that works for you and your team will be a breeze! Ask each potential bowler to join your team in person or with a personal message. Most people respond best when asked personally—either in person, or via text or email. Help your teammates register by sending them to BowlForKidsToday.org to create their own fundraising page. Need help? Check out the “Bowl For Kids’ Sake Registration Guide”. Once your team has created fundraising pages, the captain should sign up for a bowling time. We get it, asking for money from others can be intimidating. The tips below will make raising the $50 minimum a breeze! Fundraise in honor of a child waiting for a mentor. Who can so no to a kid? Putting a face to BBBS-ETN’s mission helps potential donors understand the impact mentoring makes in the lives of area youth. Remind supporters that kids who have Bigs are more likely to graduate high school and college, less likely to use drugs and alcohol, and they have higher self esteem than their peers. (Did we mention there are more than 100 children waiting for a mentor right now?) Click here for photos and bios of children waiting for a mentor. Build a personalized webpage. Creating your own fundraising page is easy and fun. Bowlers who utilize this tool to raise funds bring in more money and help support more matches between Bigs and Littles! Need tips on how to set up your personal site? We’ve got you covered. Tell your story. Whether asking for a donation or for someone to join your team, your enthusiasm and passion are contagious. Talk about someone who made an impact in your life as a mentor. If you’re a Big Brother or Big Sister, tell donors about the amazing outcomes and personal experiences you’ve had with BBBS-ETN. Make a list. Jot down the names of everyone who may donate to you, and start by reaching out to them. Remember that many companies will match an employee’s contributions to a charity. Ask your HR Director or Office Manager if your company participates in a Company Match program, and encourage your donors to do the same. Set a goal and make a personal donation. Get your fundraising started by making a personal gift, whether it’s $5, $50, or $500. This will show momentum and encourage others to donate as well. Then, decide how much you hope to raise and tell donors your goal. As you get closer to your goal, supporters will want to help you reach it! Say thank you. Let your supporters know how grateful you are. Thank them on social media and in person. Consider sending a handwritten thank you note to everyone who makes a gift to your page. With their help and yours, BBBS-ETN will match 125 marginalized children with a safe and caring mentor! Thank you for creating a Bowl For Kids’ Sake page – now it’s time to personalize and fundraise! In minutes, you can customize your page with a photo and a story. Once your personal page is complete, be sure to send emails and post to social media to request donations and to recruit teammates. Add a profile photo. Set your page apart by sharing a photo of your bowling team, you and a mentor in your life, you and your Little, or even an image provided by our agency. People are more inclined to donate to your page when they can “see” what you are raising money for. Need help picking the perfect profile photo? Follow this link for a few from our agency. Include a description. Everyone’s reasons for making a donation are different, and this is your chance to let the world know why BBBS-ETN matters to you. Whether you feel strongly about the work that the agency is doing or you’ve personally benefited from our services, let everyone know why you are raising money for BBBS-ETN! If you’d like to fundraise in honor of one of the children on our waiting list, you can post their photo and bio to your page. Follow this link for stories of Littles on the waiting list. Set a goal. We’ve set a fundraising minimum of $50 per bowler (and $250 per team), but we highly encourage bowlers to aim high and “Make a Match” by raising $1,000 per individual or team. Be sure to indicate your goal on your page. Establish yourself as a team captain. If you are a captain, add it to your personal page so your friends can join your team! Here’s how: login to your page and click the tab “Team”. On that tab you will see the question “Are you a part of a team?”. You will click “Yes, and I am a Team Caption.” Once you hit save, your team’s page will be available for you to edit and personalize. When your team members login, they will click “I’d like to join a team” and will select your name. Share away! A recent study found that bowlers who send emails can raise between 2 and 11 times more than those who do not send emails. Something else to think about: people read emails from their friends and family, even fundraising emails, in greater numbers than they do fundraising emails from organizations. YOU have the power to share your story and make an impact. Did you know: Bowlers who update their personal pages raise between 7 and 18 times more* than bowlers who do not update their pages! Why? Because including photos and stories helps donors connect with you and with the mission of Big Brothers Big Sisters of East Tennessee! Questions? Shoot us an email at Development@TennesseeBig.org! P.S.- After your page is set up, be sure to check in with your team captain to ensure your team has its lane reserved! If you’re a team captain and your lane is not reserved, click here! *2017 study by Blackbaud CRM Services. 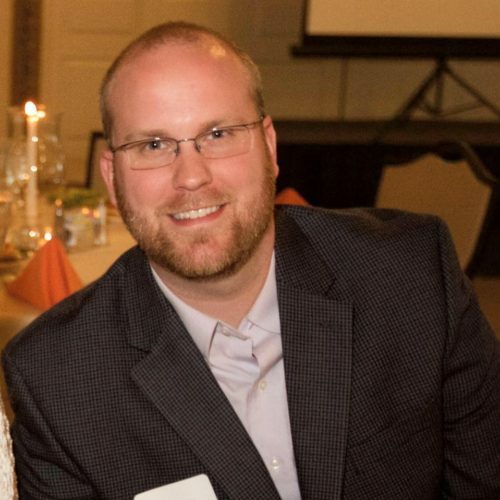 KNOXVILLE, TN (Feb 12, 2018) — Big Brothers Big Sisters of East Tennessee has named Tyler Boldin as its Chief Development Officer. Boldin moved to the non-profit sector in 2016 after 10 years of consumer and commercial banking experience. As the manager of major gifts and leadership giving at The United Way of Greater Knoxville, Boldin identified and built relationships with numerous supporters across the region. 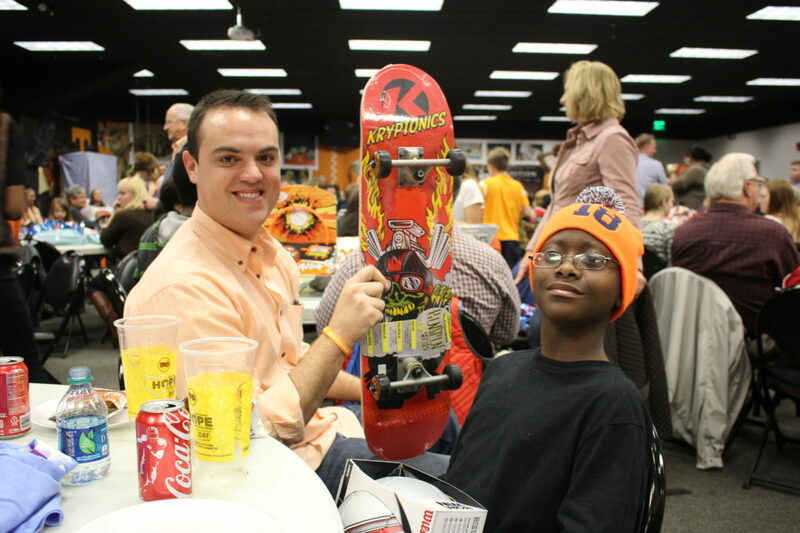 A University of Tennessee-Knoxville alumnus, Boldin has served as the board president of Character Counts of Knoxville and Knox County since 2015. Big Brothers Big Sisters of East Tennessee provides at-risk children with strong and enduring, professionally supported one‐to‐one relationships that change lives for the better, forever. More information is available at tennesseebig.org.  KNOXVILLE, TN (January 23, 2018) — Big Brothers Big Sisters of East Tennessee (BBBS-ETN) has named Brent Waugh as its Chief Executive Officer. Waugh, who joined the agency in 2017 as Chief Development Officer, takes over for Doug Kose, who led the organization from 2013 through January 2018. From 2013 until joining BBBS-ETN in 2017, Waugh worked at Northwestern University as director of marketing and communications in the division of Alumni Relations and Development. Prior to Northwestern, Waugh worked in fundraising Colorado State University in Fort Collins, Colorado. In addition to his work at BBBS-ETN, Waugh is a member of the Knoxville Track Club and the Tennessee Technological University Alumni Advisory Board. He also volunteers for many area organizations, including Keep Knoxville Beautiful and the Fourth and Gill Neighborhood Association. Waugh earned an M.S. in Journalism and Electronic Media from the University of Tennessee Knoxville and a B.S. in Psychology from Tennessee Technological University. Big Brothers Big Sisters of East Tennessee provides at-risk children with strong and enduring, professionally supported one‐to‐one relationships that change lives for the better, forever. More information available at tennesseebig.org. KNOXVILLE, TN (Jan. 8, 2017) – Big Brothers Big Sisters of East Tennessee has named its Bigs and Match of the Year in conjunction with the agency’s celebration of National Mentoring Month. Sabrina Childs is the 2017 Big Sister of the Year. Childs and her Little Brother De’Aries were matched in December of 2011. Childs chose to mentor a boy after finding out how many boys were on the BBBS-ETN waiting list. Childs and De’Aries enjoy cheering on the Vols, going out to eat, rock climbing, and woodworking. Childs is not only a Big Sister, she’s a member of the Board of Directors and a donor to the BBBS-ETN Creating Big Futures campaign. She also serves on the BBBS-ETN Golf Classic Committee and participates in the agency’s Bowl for Kids’ Sake event. Brent Crabtree has been named the 2017 Big Brother of the Year. He met his Little Brother, Deontae, just over three years ago. Crabtree and Deontae enjoy throwing football, riding bikes, and participating in community service activities together. Crabtree says he was surprised and excited to be given the Big Brother of the Year award. In addition to volunteering as a Big Brother, Crabtree serves on the BBBS-ETN Fund Development Committee and supports the agency’s Creating Big Futures fundraising campaign. Big Sister Stephanie Smith and her Little Sister Josie are the first-ever BBBS-ETN Match of the Year. Smith and Josie met in March of 2015. Smith works with her Little Sister to set goals for her life, and says she’s been pleased with how Josie has grown into a responsible and mature youth. The two love crafting together, and both Smith and Josie say they can talk about anything. Recipients of the Big and Match of the Year awards were honored at a private event in December 2017. Big Brothers Big Sisters of East Tennessee provides children facing adversity with strong and enduring, professionally supported one-to-one relationships that change lives for the better, forever. Find out more at tennesseebig.org. Launched in 2002 by MENTOR: The National Mentoring Partnership (MENTOR) and the Harvard T.H. Chan School of Public Health, National Mentoring Month focuses national attention on the need for mentors, as well as how each of us—individuals, businesses, government agencies, schools, faith communities and nonprofits—can work together to increase the number of mentors to help ensure positive outcomes for our young people. KNOXVILLE, TN (Nov. 30, 2017) – Big Brothers Big Sisters of East Tennessee will host a Holiday party for mentors (Bigs) and their mentees (Littles) on Saturday, Dec. 2. The fifth annual BBBS-ETN Match Holiday Party, sponsored by Knoxville Pediatric Associates, takes place from 11 a.m. until 1 p.m. in the Summit Ballroom at the Crowne Plaza Knoxville. When: Saturday, Dec. 2, 11 a.m.-1 p.m. On-site contact will be Chief Development Officer, Brent Waugh at 865.804.1288.